You’ve all waited for it, and it’s finally here. Album 59, Taking the Plunge, is now available as a digital download! Description of the Album: Wooton’s unexpected marriage proposal to Penny triggers a lot of soul searching around Odyssey. Penny wants to know what it means to be committed to someone for the rest of her life. Connie can’t be sure how their relationship as friends will change. Meanwhile, Wooton is looking into rebuilding his house, but runs into conflict with the neighbors. Eugene uses his computer talents to help the Odyssey Police solve a mystery at the bank. And Buck becomes entangled with Vance’s gang in a way that looks like trouble. Where will it all lead? 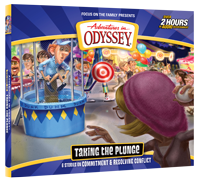 Join the folks in Odyssey as they take the plunge to learn about commitment, discernment, expectations, resolving conflict, family legacies and more. Digital copies of Album 59 can be purchased currently via iTunes ($10.99) and Amazon ($6.93). If you’re a part of the Apple universe, the download via iTunes may be your first pick. However, if you’re looking for the best deal, then Amazon may be your option. The album will be available from the Focus on the Family Store shortly. In addition to six brand-new Adventures in Odyssey episodes, Album 59 also contains a bonus behind-the-scenes track. Odyssey CD collectors, be sure and grab your physical copy this August! Now Available: “Taking the Plunge” on CD! Download the First Episode of Album 59 for Free!